Plainly put, there are not too many pairings that could sing better than this tandem. This recipe is so simple because everything can be prepared in advance and then all you need to do is cook the rice and assemble the finished dish. For this version, I wanted to add a little heat, so I used a mix of sweet and hot sausage. The first thing I did was grill the sausages and set them aside. Rather then remove them from the casing, I wanted to add a little char flavor to the dish. Once cool, slice crosswise and hold until ready to use. Chop the broccoli rabe into bite size pieces. This is more important for the stalks than the flowers/leaves since the latter will wilt. Blanche the broccoli rabe for about 2 minutes in boiling water. Drain and allow to rest. Start the rice by sauteing the onion in a dab of extra virgin olive oil until soft. Add the rice and toast for a minute or two and then add the white wine. Have your chicken broth warm and ready. Ladle the broth a bit at a time and wait for the rice to absorb it before adding more. 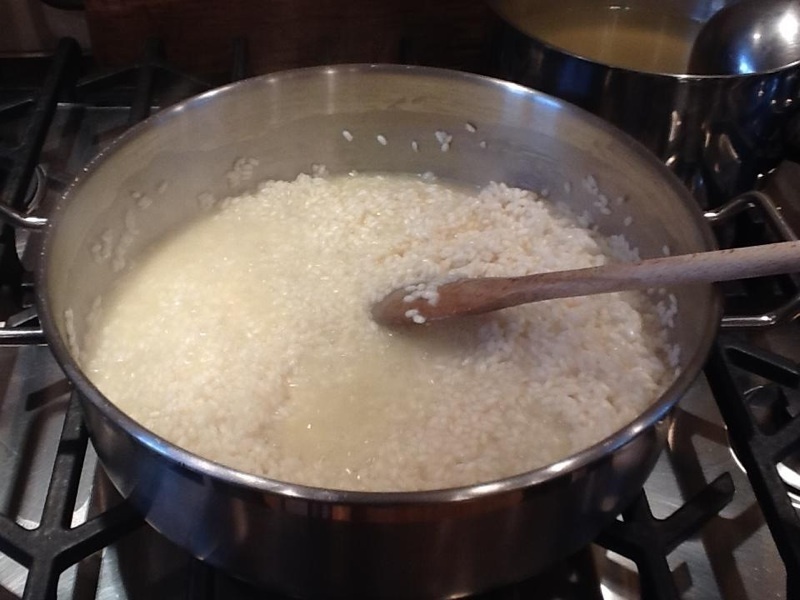 About half way through – taste the rice like you would pasta; it should be al dente but not sticky – add the butter. It’s no more difficult than this. Stir stir stir. 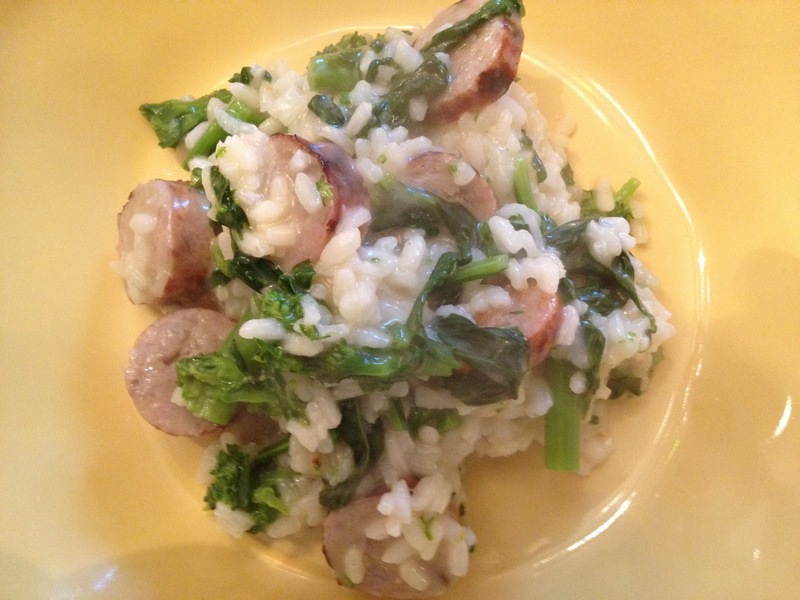 When the rice had about 10 minutes more to finish, I added the sausage and the broccoli rabe. This is just long enough to warm them through and blend with the risotto as it finishes. Pass Pecorino Toscana at the table. When I think of a dish like this, I can’t help but turn to Tuscany and Chianti Classico. The earthiness of the sausage, the char from the grill, the bitter greens, it’s always a perfect match and this time, I reached for a masterpiece of a wine. 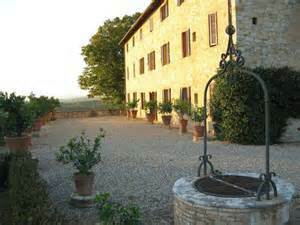 The Castello di Bossi estate sits atop some of the most beautiful Tuscan hillsides imaginable. The estate covers 650 hectares, about which 124 are under vine. Those 124 hectares are planted mainly to Sangiovese, with Cabernet and Merlot in supporting roles. Many of the vines are 50+ years of age. The “Berardo” vineyard sits atop clay, silt, and crushed rock and produces exceptional quality Sangiovese grapes. 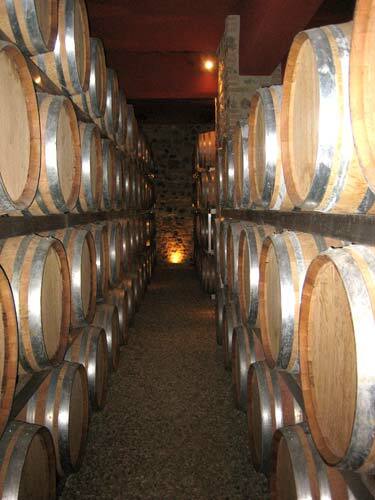 The wine is fermented in stainless steel and then aged for 18 months in lightly toasted French oak barrique. 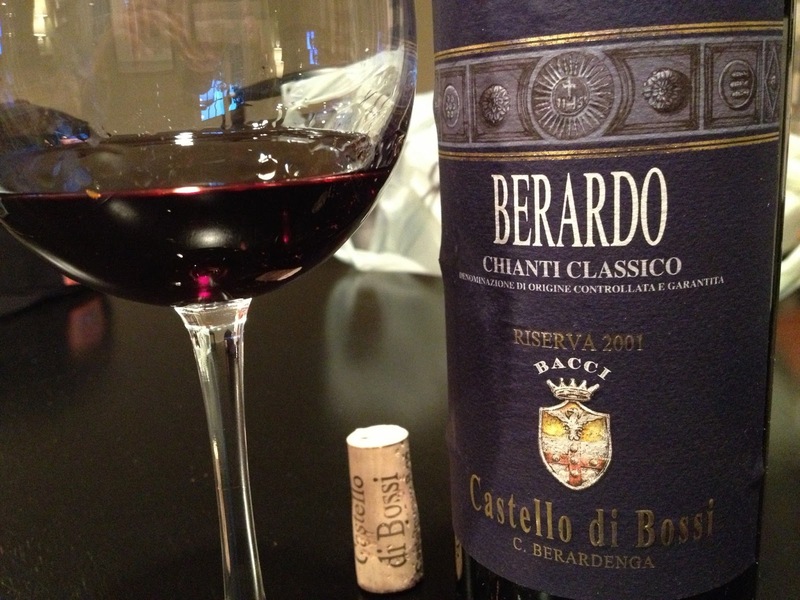 The 2001 Berardo Chianti Classico Riserva is a towering example of what great Sangiovese can become with cellaring. There is nothing “second class” about this wine. It’s the equal of the best Brunello and the most refined Sangiovese Super Tuscan. Crafted from 100% Sangiovese, the wine is a dark blackish red, even at 12 years of age. The nose is redolent of a warm summer Tuscan afternoon. Have you been there? Can you see and smell it? The dusty road, the wild flowers, the floral aromatics being carried by the wind, the dried herbs, all lead to a crescendo of crushed wild berry fruit. On the palate the wine is pure silk. It’s a symphony of flavors: leather, earth, crushed berries, anise and smoke. The tannins have aged to a mellow supporting role and the acidity gives the wine all the freshness it needs to marry with the risotto. There’s an aged mulchey, “bottle sweetness” to the fruit that can only be achieved by slow cellaring. It’s difficult even to describe. To close, simply to say, this is one of the best Chianti Classico Riservas I have ever tasted. Stunning. 95 points. Current releases can be bought for $35-$40. Sounds and looks great! I have never tasted anything from that producer but will do… Thansk for the heads up! The same family also owns Renieri in Brunello. I just reviewed the 2007 recently and it too is stunning wine. The Castello di Bossi Chianti Classico is only about $13-$15 and it's a steal at that price. Beautiful wine from Berardenga. Hi John. This is the first time I write a comment. I discovered your blog a few weeks/months ago and I really enjoy reading your tasting notes on Italian wines. I find it's really interesting and relevant for us, consumers who have limited amount of money to spend and therefore have to chose wisely, to get a point of view from an amateur (i guessed that but i might be wrong here) but experienced and passionate taster like you. It adds up to available expert tasting notes/ratings which may not always be reliable nor consistent. That said, I will surely try to put a hand on this castello di bossi chianti classico riserva (don't know if it's available here), thanks for the nice suggestion. Talking about "best chianti riservas ever had", I want to share with you this one if you never had it: Vigna del Sorbo from Fontodi (as i write this i'm telling myself that you probably already had it), stunning wine (whatch out though, apparently the 2009 vintage from this wine isn't as good as previous ones). Cheers and keep up the good posts (while i'm trying to catch up on older ones)! P.S. Great discussion on the DOCG issue the other day, enjoyed it! Thanks for commenting, and you suspected correctly. I am certainly an "amateur" taster and I surely know Vigna del Sorbo. You know, surely I think there are times when a wine tasting follows the path of a wine itself, in the sense of the wine's terroir coming together to make the wine. With the Castello di Bossi, it was everything, my mood, palate, the environment, the age of the wine, the company, the food…it all came together to create a wonderful experience. There are likely better Chianti Riservas out there, but I'll remember this one for a long time. And it was a great, if somewhat underappreciated vintage. Also, if you look at my review of the Gambero Rosso tasting I think I tasted the '09 Vigna del Sorbo. I recall it being good, but not like Flaccianello. I'm glad you enjoy the website and thanks for commenting!